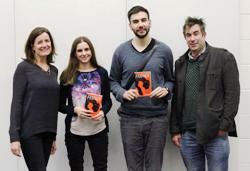 Literary agent Ella Kahn (Diamond Kahn and Woods) and novelist David Owen (Winchester Creative Writing BA and MA graduate) gave a talk about the agent / author relationship and David’s debut novel, Panther, as part of the Winchester Reading Series at the University of Winchester on 20 January 2015. They were interviewed by Charlotte Comley, a student on the the MA Writing for Children course and Litmus 2015 contributor. We represent our authors and their writing around the world; we are the middle woman between author and publisher. We’ll edit manuscripts to get them into the best shape, then place our books in the hands of the most suitable editors for our writers and negotiate a competitive set of royalties and advance. We also help build our authors’ careers, steering them through the publishing industry. At Diamond Kahn and Woods, we have a very hands-on approach when dealing with clients. Roughly how many submissions land in your inbox each week? Around 70 a week, so it’s very important that you visit our website and follow the submission guidelines. Little mistakes can be very off-putting. Get the agent’s name right! Remember, a covering letter should be professional: clear, concise, and always more about the book than the writer. I like to read a blurb in the submission letter. I want to get excited by the writer’s work before I check it out. What do you dislike in submissions? Don’t tell me it ‘will appeal to everyone’ or that it is ‘a guaranteed bestseller’. Or that all your friends/family have read it and think it should be published. Also, don’t be critical of other people’s work, or even other genres. Read a lot. Know the market. Research agents and publishers. Don’t overwrite. Edit your work. Show that you are as professional as it is possible to be. It makes a lot of difference. Remember, your agent will google you! This is especially important if you are a children’s writer. Good writing stays in the agent’s mind. What was it about David Owen’s work that called out to you? Voice. I was hooked straight from the start. Unfortunately, I was working at another agency at the time and it wasn’t suitable for their list. However, when Bryony Woods and I set up Diamond Kahn and Woods, I decided to get back in touch. I loved his writing; it was something I felt very excited about. The opening scene was straight into the action of a boy stealing a gun. How did you cope with the disappointment of your first book not being sold? Getting an agent was a very exciting point in my career. I coped with the feedback emails and calls by sitting in my room writing, and that’s when I started Panther. A lot of the feedback from my first book which I received from editors was very encouraging. I learnt from my first book. How do you feel about Panther being published? To be honest, most of the time it doesn’t feel real. I keep getting exciting snippets of news, like the possibility of a film, but I just try and focus on writing. What most people don’t understand is how long the process takes. I must admit to being excited when I saw the proof copies of Panther. I absolutely adore the cover. It’s striking, and is beautifully evocative of what the book is about. I really couldn’t be happier with it. If anything Panther encouraged me to work harder. I have completed a book for the younger readers that Ella is looking at and is currently sending out to editors and am working on another novel for a YA/crossover audience. But at the moment I have taken a full-time job. So my day involves me getting up early, doing two hours of writing before work and then two hours when I get home. David achieved 1st class honours in BA Creative Writing and an MA Writing for Children at The University of Winchester, where he went on to teach on the BA Creative Writing course for three years. He hopes that one day all of his students will surpass his own achievements. David’s debut YA novel, Panther, is published by Constable & Robinson in May 2015. Panther is a funny, touching and occasionally unsettling coming-of-age story, which deals candidly with the stigmas and misunderstandings surrounding depression. Ella co-founded Diamond Kahn &Woods Literary Agency with Bryony Woods in 2012. She has an MA in Publishing from University College London and a BA in Anglo-Saxon, Norse and Celtic from the University of Cambridge. She was Chair of the Society of Young Publishers in 2011 and has also volunteered as the SYP’s Events Officer and Treasurer. She became a Freeman of the Stationers’ Company in 2012. Ella was included in The Bookseller’s list of Rising Stars in 2013. This entry was posted in Winchester Reading Series 2015 and tagged agent, author, David Owen, Diamond Kahn & Woods, Ella Diamond Kahn, Literary Agency, YA by Litmus 2015. Bookmark the permalink.